This year IMATS played host to huge international artists and local makeup legends while featuring new and incredible products from some of the worlds best cosmetics brands. Our course convener went down to suss out all the action and help out one of our favourite brands, IMATS major sponsor, Kryolan. 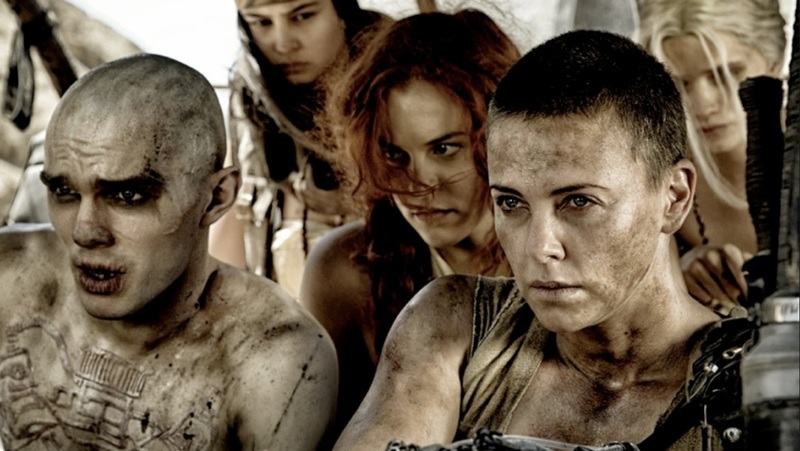 IMATS stands for the International Makeup Artist Trade Show and is held each year in major cities around the world. 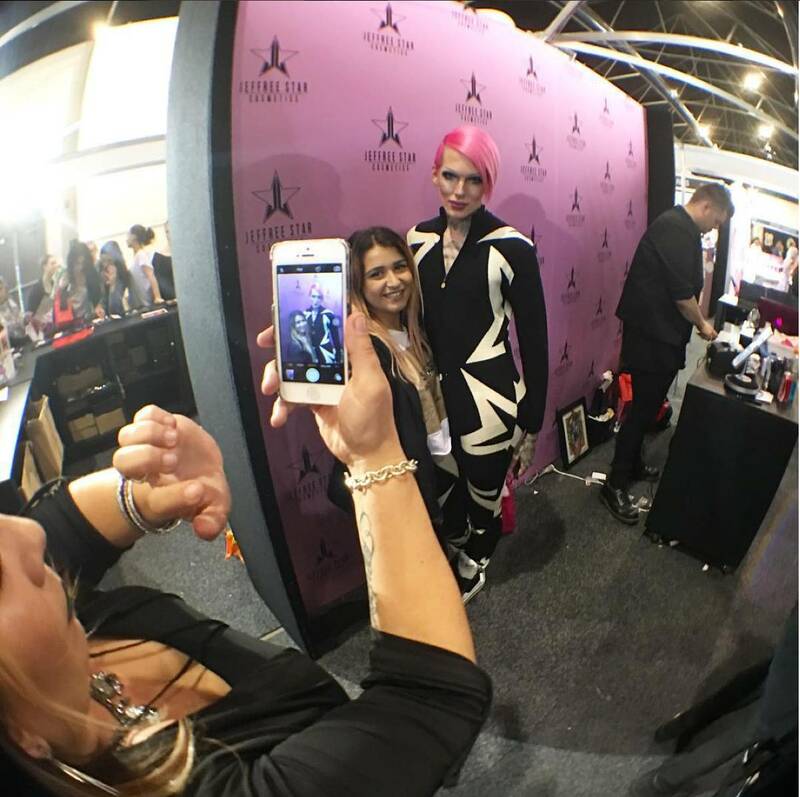 The Sydney event is a must see exhibit for Australian makeup artist and has been visiting our shore since 2009. Our 2015 show didn’t disappoint with over 22 pro makeup speakers and 46 exhibitors. This year saw the new comer on the block Jeffrey Star introduce his unique brand to the Aussie market and fans went ballistic! To put it in perspective makeup enthusiasts and Jeffery fans tore through the venue as if HnM had another sale on Balmain! 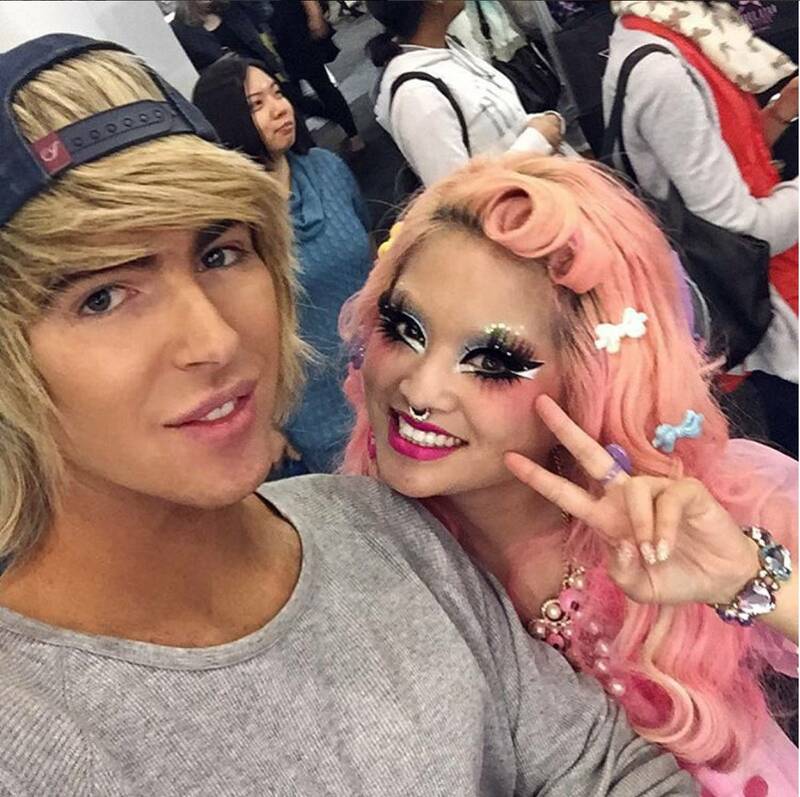 For the second year running the super bright harajuku lovers Sugar Pill were a massive hit with die hard Aussie fans! Their leading lady Amy also known on Instagram as Shrinkle wore the most incredible colourful makeup while her crew wore equally as cute pastel rainbow makeup! Model rock lashes brought out the Vogue artist Roshar to create two unique avant guard looks. 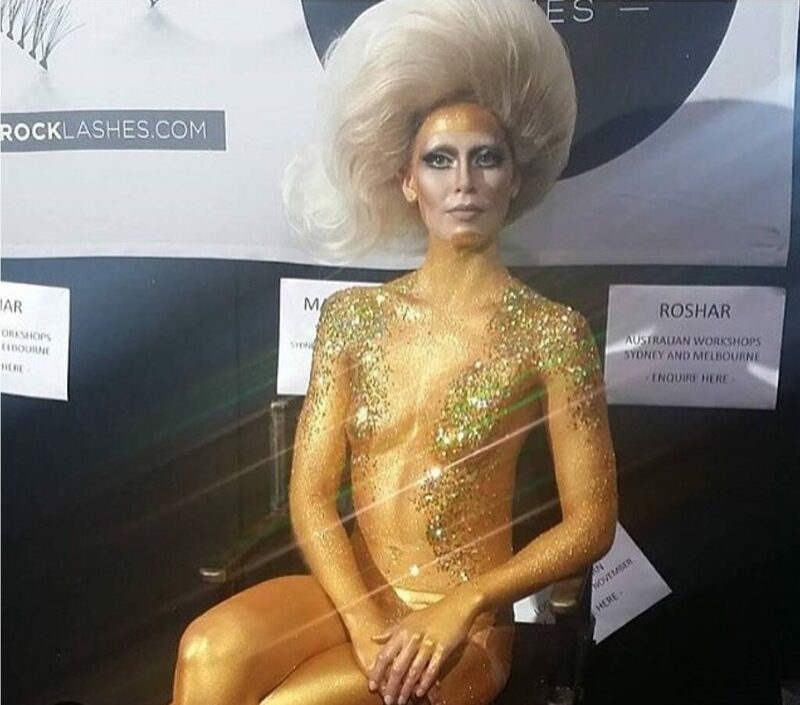 Roshar’s theatrical and magical take on fashion makeup shone bright on the stage as his beautiful model Hannah’s entire body was covered in Gold glitter! The boys from Odd studios Damian Martin and Adam Johansen (best known for their work on Mad Max: Fury Road, Star Wars: Episode III—Revenge of the Sith, Farscape, The Wolverine, The Matrix Reloaded, Babe: Pig in the City, Where the Wild Things Are, Superman Returns) were incredibly inspiring as key note speakers. 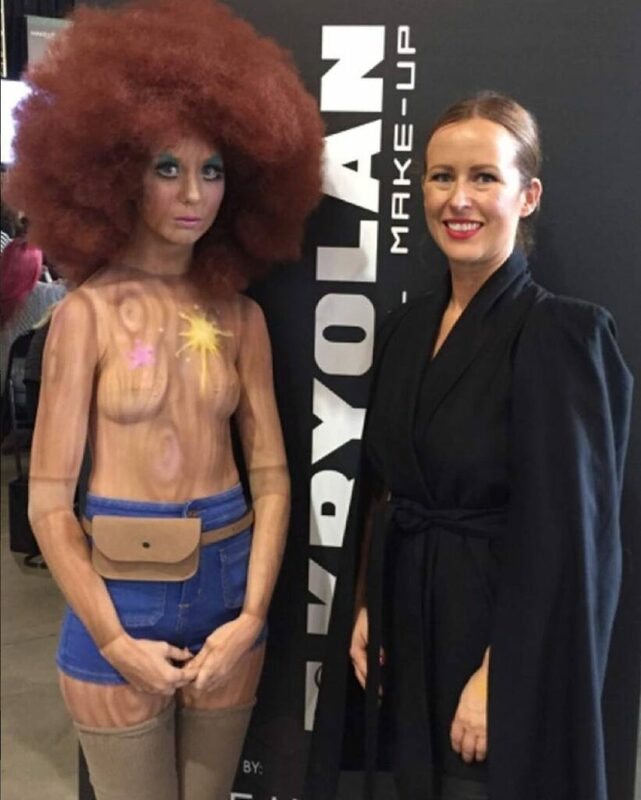 Long time supporter of the school, the exceptionally talented body artist Becca Gilmartin, graced the main stage for Kryolan. On the first day she taught us how to better conceal tattoos with dermacolor and on the second day she created an amazing air brushed wooden girl! Becca is also the new editor of beauty magazine LAUD which is definitely worth checking out. In summary Michael explains: “In a nut shell IMATS was awesome. There were almost too many highlights to mention but it was exciting to be apart of all the buzz while catching up with industry leaders like Rae Morris, Roshar and Martin Bray. I loved helping Kryolan and had a blast demonstrating their new Nebular air brush colours! It is amazing to see so many incredible artists in one venue. I can’t wait for next year! Becca Gillmartin with her beautiful wooden girl – air brushed with complexion tones from the new Nebula range. Our Course Convener Michael with his model Wyatt from QUE Models. 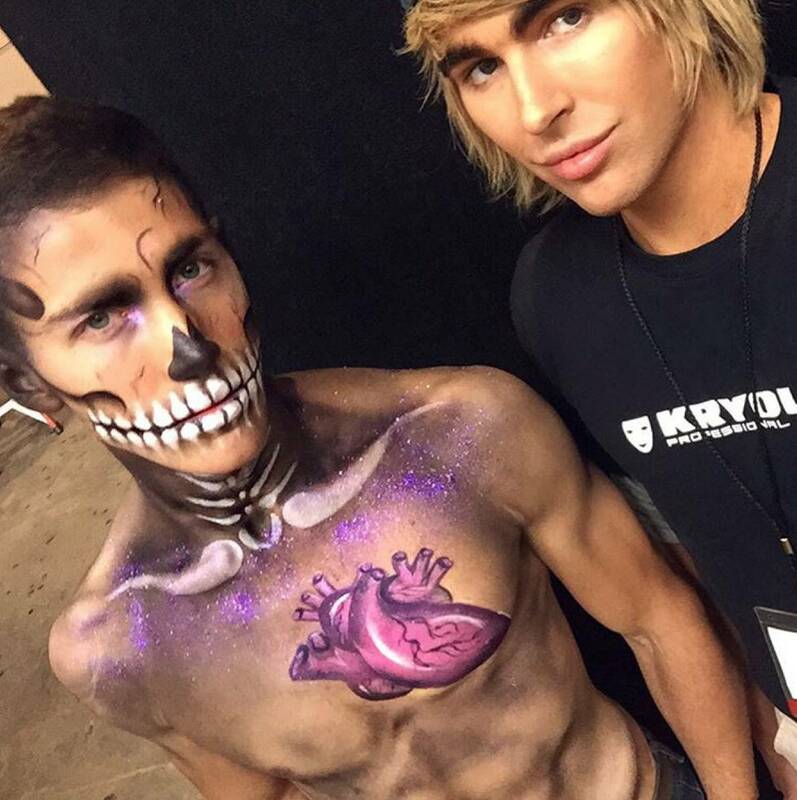 Wyatt’s skull and heart look was air brushed with Kryolan’s new Nebula Air brush products.